I came across this quote at a time in my counseling journey when I was beginning to be less concerned with what a struggle was and more concerned with the dynamics of how a struggle worked. There was a time when I would have read this quote and responded, “Yes, but what is an addiction? Is it a disease? Is it a habit? What is the best category to place the experience of addiction in?” As a linear thinker, these questions seemed like the first and necessary questions to address before productive steps could be taken. Honestly, I am glad I did not come to this quote during that phase of my development as a counselor. As important as those questions are (and they do have value), I think I would have missed something more important. What is the benefit of identifying this pattern? It allows for a more productive conversation than, “Stop it or your life is going to deteriorate,” to be engaged (which is accurate, but often unhelpful starting point). What is this new conversation? 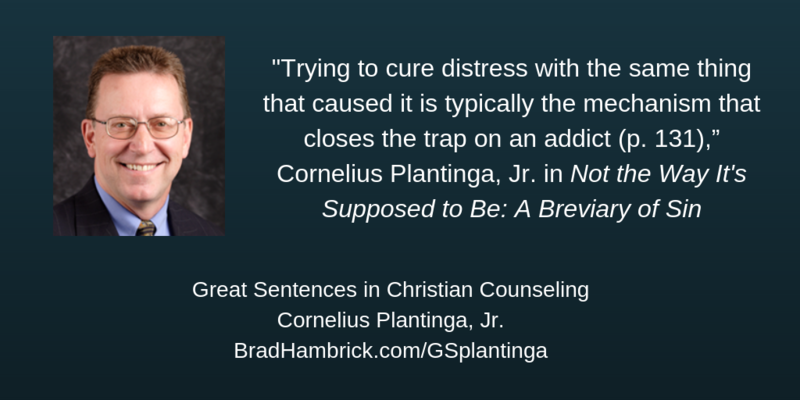 The addict (or liar, or controlling spouse) is focused on the initial distress. Their focus is on, “I can’t handle this insecurity… uncertainty… stress.” They view their dysfunctional behavior as a remedy for what they perceive to be unbearable. Why? Because they attribute the additional distress of their dysfunctional behavior to the original life stressor. If we get a “yes” to a question like this, then the dysfunctional behavior which they thought was serving them can begin to be unmasked as the cause rather than the solution to their greatest felt need. Creating mistrust of sin can be an effective step towards cultivating trust in Christ. The more habituated the sin, the more necessary this intermediary step can be. This sentence from Plantinga helped me concisely put this dynamic into words. Having a concise summary of the pattern helped me be able to explore the possibility that this dynamic may be at the root of an entrenched struggle with many counselees. In many ways, it has served like a modern proverb on folly. It put the dynamic of folly into words so that it could be seen more clearly through the fog of chaos. Seeing what was going on (i.e, pattern) helped cultivate motivation for the wisdom of the next step of obedience.